With the conclusion of this week I have officially been away from home by myself for the longest period of time in my life. Back in 2012 I studied abroad in Queretaro, Mexico for 10 weeks. With two more weeks to go I will finish out my internship and do a bit of sight seeing to make sure I hit all of the major points on my Cape Town to-do list before I have to leave. Work this week consisted of a couple days of computer working, continuing to chug away on the camera trap project, and two meetings. On Tuesday the Gantouw Project meet with Cape Nature. Cape Nature is the responsible organization for biodiversity in the Western Cape. The reason for our meeting was to talk about getting a certificate of adequate enclosure for the reserve and a permit to transport the eland to other sites. Obtaining a certificate of adequate enclosure depends on what type of animal one is trying to have on their reserve. In our case it is the eland and also hippos that have been around for several decades. In order to meet the requirements for eland, the perimeter fence must be 2.8 meters tall. The permit for transport of the eland is needed to move them from Rondevlei to other reserves and sites that could benefit from the browsing and grazing pressures of the eland as a management tool. In order to obtain this permit, the receiving site must also have adequate enclosure for the eland. To move the eland, the project will also need a ‘hunting’ permit. This permits the herding of wild animals for transport purposes. Our second meeting of the weeks was with the Nature Care Fund. This is a group of CTEET personnel that work on all different projects coming together to discuss and then hopefully implement the best conservation practices they can. The mission of this group is to invest and disburse monies from Private individuals, Corporate companies, Friends groups and other bodies towards nature conservation projects. It was fun to sit in on this meeting and get to see to group operate and hear about all the different projects going on. On the activity front this week, it was pretty jammed packed. Mondays I go to ultimate Frisbee held at the University of Cape Town’s cricket and track field. Tuesday involved going to Forex for quiz night, which we did not win. But the best part was the overnight excursion to Cape Agulhas. This trip started Friday morning by going to the city center to pick up a rental car. For those of you who do not know, in South Africa we drive on the left side of the road and in the right side of the car and almost all the cars are manual. Luckily for me I am ambidextrous, writing with my left and doing most other things with my right. As far as shifting and driving goes it took me all of about 2 seconds to get the hang of it. The only trouble I had all weekend with driving was using the windshield wipers a couple of times when I meant to use the blinker. So from Observatory we drove to Cape Agulhas. This was a little of a three hour drive with only one quick bathroom break. We went straight to the southern most tip of all of Africa as soon as we arrived. Many people who visit Cape Town of South Africa think that the Cape of Good Hope located at the end of the peninsula here in CT is the southern most point. However, they are wrong. It is the southwestern most point, but not the southern most. After a little bit of enjoying the view, this is also the point where the Indian and Atlantic Oceans meet, we headed into town for lunch. We then checked into our Airbnb, which was an ocean front house in L’Agulhas. We then went and checked out a ship wreck down the coast a little ways, got some chicken for a braai and went and hung out at our Airbnb for the night. Saturday started with a wonderful homemade breakfast cooked by our host followed by a scenic drive through the Western Cape on our way to Hermanus. This time of year Hermanus is filled with people there to get a glimpse of the migrating Southern right whale. Spent a couple hours in Hermanus watching the whales, eating lunch, and watching the whales. It was really fun to see them swim around, waving their fins, and breaching. We watched an adult whale breach several times followed in suit by a calf. Then it was off to Betty’s Bay which is home to one of the two mainland African penguin colonies in South Africa. It was much quieter here compared to Simon’s Town but the penguins were just a great. The day ended with a windy, cliff-side drive to Gordon’s Bay, and finally back to Obz. I returned the car Sunday morning, got a quick coffee and pastry at St. James Cafe, did some grocery shopping and then it was off to Kirstenbosch National Botanical Garden. We spent a few hours here just enjoying the sun and the nice weather. After the garden, I went to Hello Sailor for some delicious risotto and disco fries (I would consider these fries their version of poutine). This wrapped up my week. It is now time to start my last week at my internship site at the Gantouw Project. This week at CTEET, second year students studying conservation from Cape Peninsula University of Technology (CPUT) embarked on a week long practical camp. During the camp the students learned about the Gantouw Project, wildlife capture using a Dan-Inject dart gun, human-wildlife conflict with a baboon case study, small mammal trapping, how to use camera traps, how to use and interpret data, environmental management plans, and many other topics. I was able to sit in on a few of these presentations and it was interesting to learn about topics that I have previously been exposed to at OSU from the perspective of another country. Conservation management can differ quite significantly in some aspects here in South Africa compared to the United States and it was good to get another perspective on how to approach this field. The weekend wrapped up with a trip to Muizenberg Beach to enjoy the wonderful sun and warm weather followed by a trip the the penguin colony in Simon’s Town. The penguin colony is home the the African penguin which in an endangered animal that lives only on the coasts of South Africa and Namibia and is the only species of penguin found in Africa. They are almost exclusively found on islands off the coast but three colonies were created on the mainland. Two in South Africa’s Western Cape at Boulders Beach in Simon’s Town and Betty’s Bay near Stony Point and one in Namibia. At the current rate of decline it is thought that the African penguin could go extinct within the next decade. Population decline can be attributed to egg poaching, oil spills, competition with fishing industry, guano harvesting for fertilizer, among others. Hopefully conservation efforts can thwart the extinction of the African penguin. This wraps up my ninth week here in South Africa. I have two more weeks of work and a week off to finish up may stay before heading home to Corvallis. This week marks the end of my second month here in Cape Town. I now have less than a month left, 28 days until I depart Cape Town, 30 until I am back home in Corvallis. So for the next 28 days I am going to stay as active as I can and try to make sure I see and do all the things that I could hope for on this trip. Work this week consisted of finishing up the photo tagging. I was able to process over 29,000 photos this week. At one point I managed 11,000 in one hour. On Monday however, I helped with a vegetation survey where we went through the reserve looking for metal tags to track how the Brunsvigia plant has done over the past 20 years. We used a metal detector and had to dig upwards of 10 cm in the sand to find all of the tags. There were very few that we could not locate and some that we found that had not been found the last time this survey was conducted. That was my life this week at work and we will see what work has to hold this week. On the activity front. Friday was wine tasting for the vactivity. We went to two wineries. Blaauwklippen and Lanzerac. Lanzerac was the first winery to bottle one of South Africa’s very own Pinotage grape. This is a red wine grape that was was bred in 1925 as a cross between Pinot noir and Cinsaut. It was first bottled in 1959 by Lanzerac and they describe it as, “smoky-soft top notes combine with black plums and cherries, hints of polish and leather. Juicy, well-integrated tannins support a spicy, meaty core with a refreshing acidity and long smooth finish”. This is the first bottle of wine that I have bought here in South Africa. It will pair nicely with a good elk steak and vegetables. Saturday entailed going to the Saturday food market near the V&A Waterfront, eating at said market (a lamb roll), a quick stop at the mall, meandering through the Waterfront market, watching the harbor and two older gentleman playing a game of giant chess, and ending with smoothies at another food market. Sunday we went to the city center to visit the South African National Gallery, a walk through the center, and some lunch at Nando’s (a South African Portuguese chicken joint that is apparently very popular in the UK). Also on Sunday, my house ran out of water. This could be for a variety of reasons. 1) As the house is now almost full, 9/10 bedrooms occupied, we went over our daily water allowance and will need to enact better water conservation efforts. In which case it will be back on Monday with our new daily allotment. Or 2) the water to the house is off and we have no idea when it will come back on. This happened at another intern house and last time I knew they still didn’t have water (it was going on four days the last time I heard anything). Hopefully this is not the case. Regardless, the housing company, Rent-a-room, brought 24 litres of drinking water and supplied each bathroom with what I would guess is a 10 L jug of water for each person to use in the bathrooms. I did not use this water to shower today, I went to a fellow Milton that lives in another house to use their shower. Hopefully it is just the first of the two explanations and the water will be back on tomorrow. Well that was my adventures for the week. This week also marked the end of the time here in Cape Town for some of the people that I have grown closest with. Coming here as part of an internship placement company and living in a house supplied for interns and students, you meet a lot of people who are also here in Cape Town for a short duration of time. These are the people that we tend to become close to, the people I go on hikes with, the people I go to the market with, the people I go to a movie with, and the people I spend most of my free time with exploring and experience this wonderful country. On my second weekend here in Cape Town I sent out a message on the VAC group message on WhatsApp asking if anyone wanted to enjoy a sunny day at Muizenberg beach. There were a few responses and so I went with one of my new housemates Alex, (from the Netherlands) to meet a group of other interns at the local grocery shop to go to the beach. Lo and behold, two of the people I was meeting with were also from Oregon. Claudia and Jess both go to Pacific University and are here doing a physiotherapy internship. This was the start of the “Miltons.” So named as it is the street where my house is, which is where we spend a lot of time together. Then a couple weeks later came Shauna (from Ireland). A little after Shauna, Alex (from England) came, then Manisha (also from England), and we became the Milton Bunch. But not everyone is doing the same duration of internship. Out of this group, I was the first to arrive here in Cape Town, but I will be one of the last to leave. Shauna was only here for three weeks, so she was the first to leave and after only those three short weeks we had already all done so much together that it was sad to have to say goodbye. Shortly after Shauna, Alex (from the Netherlands) left. She was here for about six weeks. This week was a particularly sad week. England Alex ended his stay here in Cape Town and we had to say another goodbye to a Milton. We had grown pretty close over the time he was here, as he also lived at the Milton house. So not only did we see each other when we all hung out together, but everyday doing normal everyday things like cooking dinner and sitting on the couches. And as the group continues to get smaller each goodbye becomes a little harder. It is sad to say goodbye to someone who has made your time in this fabulous country even better. And not only did I have to say goodbye to Alex this week, but another intern that I became close with left the same day as Alex, Sam. Sam is from New Jersey and we always had a good time with him. We mostly saw Sam on Thursday nights when we would all go out and he was always one to keep pushing the night longer. On the first night I went out here in Cape Town, Sam kept me out until, if I remember correctly, around 3 am. Hanging out in one place, going to another to play pool, and back to the first place. Sam genuinely just likes to be around other people and didn’t like to end a night early. So this week was filled with goodbyes and leaves the Miltons with four. Hello everybody! I have sailed past the half-way point of my time here in Cape Town but do not have much new to share. It was a pretty typical week. Nothing out of the ordinary at work this week. I spent the second half of the week working from home so that I could use my personal computer to tag photos. The computer at work is fairly old and the most photos I have been able to process in one day has been 7,000. By staying home and using my personal computer I was able to process 23,000 photos in one day and I even got to sleep in a bit. I have a little under 30,000 more photos to process so I will probably stay home a day or two this next week to get those completed and off my plate for the rest of my time here. After I complete the photo processing I will clean up the excel sheets and most likely be done with that project. Other than photos, I helped the monitors clean out the boma on Tuesday (which is literally just raking and shoveling eland feces) and helped with some more trailer training. That was all that happened at work. On the activities side, I hiked Table Mountain, went to a market, casino, and a movie. On Friday the VAC activity was a hike to an area called Cecilia Forest, as this did not interest me and some of the other interns we decided to hike Table Mountain instead. This meant two hours straight up the side of the mountain. It was definitely the most difficult hike that I have encountered here in South Africa but good news, we were able to take the cable car back down. What took two hours to climb, took only about three minutes to go down. It was an exhausting trek but we all felt very accomplished to reach the top, especially after seeing all the people who took the cable car to the top rather than hiking. On Saturday we went to Mojo Market in Sea Point. It was a very stormy day so it was nice to find an indoor market with heaters. It was just a small food market with a few trinket and clothes shops. I had a Korean chicken dish that was pretty tasty. Later Saturday evening a group of us went to the GrandWest Casino. We did not go there to gamble however. The casino is a complex that has a food court, ice skating rink, the casino (obviously), and a movie theater. The theater is the reason we went, although we did try our hand at some gambling. It did not go well. We couldn’t even get the slot machines to take our money, so we left without gaining, or losing. The movie we went to was Crazy Rich Asians. I enjoyed it and it was nice to sit down and veg out for a couple of hours instead of always trying to find something to do. On Sunday I took a lazy day, did my laundry, went to the store, read (I am currently reading Trevor Noah’s book titled Born a Crime) and watched some Netflix (currently into Black Mirror). It was a pretty mellow week. We will see what this next week holds. I am now exactly halfway through my time here in Cape Town. 6 weeks done, 6 weeks to go. It is bittersweet. On the one hand I am that much closer to going home and seeing everyone that I miss. On the other, I have 6 more weeks to explore. There is nothing out of the ordinary to write about this week. Work was work. For our Friday activity we went to Muizenberg beach and enjoyed a sunny afternoon there. Saturday went to the Old Biscuit Mill for some food and then a soccer match in the evening. Sunday was occupied with some Netflix with friends, grocery shopping, and relaxing. So instead of writing about the details of those activities I thought I would share with you a transcript of some questions I have answered as part of my OSU internship requirements. What is your work schedule like? Describe your work. What activities and tasks are you doing day-to-day? Please be specific. How do you balance your time between work and exploring life outside of work? Work takes place Monday through Thursday from 07:30 to anytime from 15:30-16:30. There are also times that I do work outside of those hours from home as it is work that can be done on my personal computer. I do not work on Fridays because this is the day that VAC hosts their weekly activities, which are paid for as part of the host site fees, therefore I attend every activity that is offered to me. My day-to-day work activities completely vary depending on what my supervisor has going on in any particular day. I do have a specific project that I work on, which is using a computer program to write data onto camera trap photos in an effort to be able to run some sort of statistical analysis when I finish. If there is nothing else going on during the day I am working on this project. However, every day can be different. We have started trailer training the eland in the mornings, so now my mornings start off by going to the boma and helping with this activity. Some days I have helped build fencing, repair the deck, and other maintenance activities. Other days I have gone with my supervisor to visit other reserves and go to a feed store to pick up food pellets and luserne for the eland. We have conducted several bird call surveys, which consist of going out into the reserve with a sound recorder and visiting ten different locations in each the control and experiment sections. Then recording two minutes in four different directions (north, east, south, and west) at each location. Some days we host school groups that come to learn about the eland and the project. Each day can be something different so there is no typical day. After work I take the train home. This activity can range from 30 minutes to an hour and half depending on when I get to the station and how the trains are running that day. Once I get home it depends on what I feel up to that day. Some days I just want to relax so I cook dinner and hang out either in the living area with my roommates or I go to my room for the evening. Other work days I have a bit more energy, so I may go out with friends and hang out, hike, or do some other activity. On Monday’s there is ultimate frisbee at the University of Cape Town sports fields, Tuesday are a culture series hosted through VAC, Thursday nights we typically go out to the local bar or to city center to hang out as most of us do not have to be to work in the morning. There is always something going on and it just depends on how active I want to be on any given day. My work life balance is pretty straight forward. I go to work at the times specified above and the rest of the time I do things that I want to in order to make the most out of this experience. This experience is whatever anyone wants to make out of it. Most supervisors that are associated with VAC understand that we as interns are here to learn about the work and gain experience, but even more importantly, we are here to learn about another part of the world and the people that live here. My supervisor is very understanding if there is something going on outside of work that I am really interested in or if there is a time that I need to take a day off because I am ill or something. I was sick for the better part of two weeks with a head cold and a sore throat and my supervisor completely understood. I took a day off work to rest and was able to work from home a couple other days in order to get better. What is your living situation like? What are the pros/cons? Do you have any related advice for future interns? I live at 49 Milton Rd. This is a ten-bedroom house with a large kitchen, washer and dryer, large living area to hang out, and a large front yard where we have a braai every Sunday with the housemates and other friends we have made. The main part of the house has one and a half baths. My bedroom is in a second detached building behind the main house. There are four bedrooms in this building. My bedroom shares a bathroom with one other room and the other two bedrooms out back have their own bathrooms. My bedroom has a single bed, a desk, a shelving unit, a bedside table, and a wardrobe. 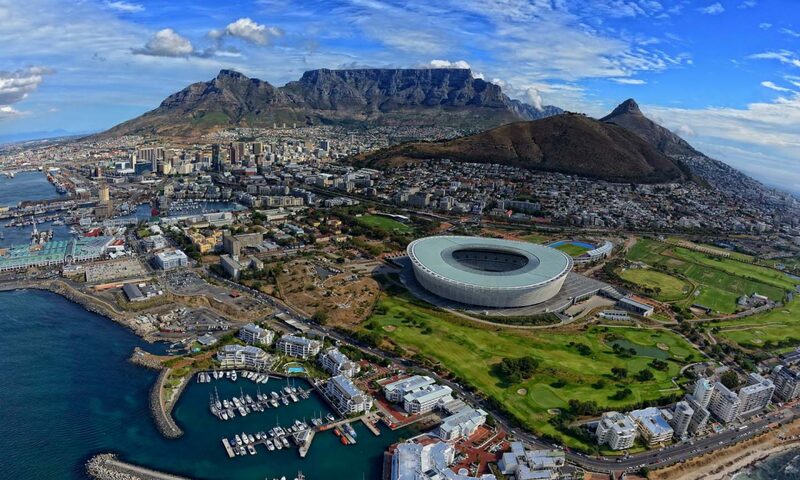 There are not really any pros or cons for me to speak of, it is a place for me to stay while I am here in Cape Town. The room is decent, and the house is fine. We had a few issues in the house the first couple weeks I was here, but I emailed Rent-a-Room with our concerns and they came within the next couple of days to take care of them. The only con I can really say is how cold the house is. It is winter here in Cape Town and although it is not as cold as back home, the house stays cold all the time and my room is also cold all time. I have two blankets that I sleep with every night and occasionally with sleep in a sweater if it is particularly chilly. The only advice that I would give for a future intern is to do your research on which house you want to stay in before you come and once you are here enjoy that you are in another country and realize that the house is just a place to stay. How do you typically get around town and to work? Are you satisfied with that choice? Would you recommend other options? Do you have time to explore the surrounding area on time off? How do you manage that? Where do you recommend exploring? On a typical work day, I take the train from Observatory to Retreat, from Observatory Station to Retreat Station is 14 stops. A month train pass for the MetroPlus is about $20. In order to make it to work by 07:30 I have to leave my house at 06:30. The train usually comes anytime between 06:40 to 06:50 and if I miss this train it could be up to an hour wait for the next one to come. From the Retreat Station I take an Uber. It usually takes anywhere from three to ten minutes to call an Uber. The price varies between about $3.25 to $5 from the station to CTEET. This depends on the availability of Uber in the area and how many riders are out there. One particularly expensive trip cost about $11 from the station to work. This was due to the minibus taxi strike that was occurring that day in Cape Town. Although, the minibuses in the Retreat neighborhood were not on strike, it was an opportunity for Uber to raise their rates and take advantage of a situation. My trip from work to home is the same in reverse. A few dollars for Uber to the train station, 14 stops on the train, and a short walk from the Observatory Station to my house. I try to catch the train home by 15:40. If I do not catch this train it is about an hour wait and the next train is always packed. If there is a day that I really just want to get home I take Uber straight from work the 49 Milton, which is about a $10 ride. Outside of traveling to work I almost solely rely on Uber to get around Cape Town. As I am usually hanging out with a least a couple other people, if not more, we all split the cost of the Uber. This has been an efficient and safe way to get around Cape Town and is not particularly expensive. A ride back home in Corvallis from my apartment to downtown would cost around $10, the same trip from my house in Cape Town to the city center is about a third of the price. As I have no other choice to get to and from work that would be any more cost efficient I am neither satisfied or dissatisfied. I am a bit frustrated with how much money I will end up spending on Uber to and from the train station for work. I spend the same amount of money on a monthly train pass as I do on one week of Uber for work. Before I arrived in Cape Town I was connected with several other interns that were working in the same neighborhood as I was and one other that was working at the same internship site. I was under the impression that at the very least there would be one other person I could split Uber from the train station to work, which would of saved me quite a bit of money. Turned out the other person at my site only went into work 2 or 3 times in the 5 weeks our internships overlapped and the others working in the same area did not want to take the train and instead simply Ubered the whole commute. I think that many interns here are discourage from using the train and other public transportation due to the perception the host organization puts on this mode of transportation. I have plenty of time to explore the surrounding area in my time off. One of the main ways to make sure this happens is by attending all the weekly activities hosted by VAC. As I am paying a fee to VAC to be here I am absolutely taking advantage of the activities they host on Fridays. I also try to do something different on the weekends. This can be hiking, exploring a new market, going to a soccer match, or taking a trip over the weekend to explore areas further away. The amount exploring that one does is completely dependent on what that person wants to do. Everyone’s experience is different, and it is what you make of it. I would recommend exploring everywhere possible. From hiking on Table Mountain, museums in the city center, the waterfront mall, to the beach at Muizenberg. There is something here for everyone and it is a matter of going out and finding what you like. This week started with a short work week. Thursday was National Woman’s Day here in South Africa, which meant only a three day work week. Since it was a short week there is really nothing new to report. I spent the three days uploading and organizing the rest of the photos that I have to tag. I have completed 30,000 so far, apparently I have 70,000 more to go. Hopefully I can make quick progress and be done with them shortly. Enough about work. Over the four day weekend I went on a guided trip through the Klein Karoo and the Garden Route. This has been one of the highlights of my time so far here in South Africa. First of all the tour guide was by far one of my favorite people I have met in this country. His name was Maudi. Maudi was quite the character. By lunch time on the first day he was already cracking jokes about the different people on the trip and absolutely made the trip as good as it possibly could have been. On the first day we did a wine tasting (at 9:30 AM) en route to our first hostel. Obviously a wonderful way to start the day. After this we stopped for lunch at a roadside stop. We continued on to the Cango Caves. This was an interesting stop as we had to climb through some very tight places. At one point we were crawling through a space that was only 23 cm tall. A bit small for my liking. That night we had an ostrich braai at out hostel, hung out by the fire and played with the three cats. The second day there was a bit of rain. We started the day with a zip lining trip over a waterfall followed by a trip to the world’s tallest commercial bridge bungee jump. Of course I participated in this activity and yes it was the most primal adrenaline feeling that I think I will ever experience. 216 meters to the ground and you fall upwards of 195 meters with two secondary falls. Check out Instagram for a video. The hostel this night was out a forest, quite a bit off the beaten track. We had a ramen for dinner and hung out around another fire while having good conversation with some South Africans from Cape Town that were also at the hostel. Saturday included a 2 hour hike up to an amazing view of the Indian Ocean followed by canoeing down a river to the beach. The hostel was a bit more urban than the others but situated right next to the ocean. Fish and chips were on the menu for dinner. There were eight of us from VAC that went on this trip and Saturday night we all just hung out in out hostel and had a few drinks. Sunday did not disappoint either. We went for a safari at a game reserve along the Garden Route. They had 4 of the Big 5 (kinda hard to keep leopards in a fenced area I suppose) along with many other animals. It was very nice to see how much space and well kept the game reserve was. When I first thought of doing a safari on a private game reserve I just thought it would be like a zoo, this was not the case and was quite nice to be proven wrong about my perceptions. After the safari we had a 5 hour drive back to Cape Town. This ends another week in Cape Town. Stay tuned for more adventures to come. As I round out my first month here in Cape Town I reflect and appreciate on the things I have done and seen here in such a short time but I also yearn for the little things back home that are a part of my everyday life. I have been feeling a bit under the weather this last week. Just a common cold that I will get through just fine but has made me a bit irritable this week. For example, today I was going grocery shopping, to a store (Pick n Pay) that is a little farther away than the closest grocery store (Spar) but has a bit larger selection. As I am walking through the store an announcement comes on that the debit and credit card machines are not operating and if there is anything that I have learned so far in South Africa, it is that when you are waiting on something there is never going to be an accurate estimate of how long it will be. Frustrating but not a big deal. There is another grocery store a little farther away that I had not yet been to so I gave it a go. It is the same company as the one that is close to me, but maybe they have a little larger selection. Well this was not the case. Same selection as the closest store to me. Once again not a big deal, I will get what I need and go home. As I am checking out I ask for cash back, this way I do not have to have the extra fee associated with the ATM. At my usual Spar and the Pick n Pay,getting cash back has not been an issue, but they have to use a different card machine for cash back transactions. So I ask for enough back so that I can purchase electricity (electricity is bought at shops and then loaded to a meter in the house, actually kinda nice as it counts down the kilowatts instead of counting up and you only buy as much as you need, can be inconvenient though if you run out when the shops are closed) and the cashier says okay but does not get the other card reader. I ask her if she added my cash back to the transaction and she says yes, asks me if I am using a debit card, I say yes, and she has me use the normal card machine. I thought, okay this Spar is a bit more upgraded and I would get my cash. But as I suspected the transaction ran as a credit transaction, she tells me I have a credit card, as if I would not know what card I was using, and I don’t get cash back. I relent and get cash out of an ATM to get electricity. I walk to the place I have gotten electricity from before and it is closed. So with all that hassle I have to go to the Spar that I usually go to and could have gone there the whole time to get groceries and electricity. And since I am sick and irritable, this was about the most frustrating time I have had since I arrived. The only time I have really thought about being home-sick. Of course I miss my family and am excited to see them when I get back, however, missing the people (and pets) that I love is much different than being home-sick. It has been all the little frustrating things this week, while being sick, that made me home-sick for all of 15 minutes this morning while just trying to run a normal errand. I am actually feeling quite a bit better today as far as my cold goes and will hopefully be fully recovered by Thursday as I am going on a 4-day trip along to Garden Route. As far as work goes this week, it was a pretty quite week. I went home early Monday because we were having power issues and I was sick. Tuesday I stayed home and slept most of the day while intermittently watching the Crown on Netflix. Wednesday I worked from home as my supervisor was out of the office and I could accomplish the days work from my own computer. Thursday was a fun day. My supervisor took me on a drive to the Helderberg Nature Reserve, which is 44 km away and after that we drove to a animal feed store that stocks pellets for antelope and then drove back to our reserve. In total it took almost 4 hours and I got to see a lot of the surrounding area around the city that I would otherwise not have had the opportunity to see. I am still working on the photo tagging and imagine that is what this next week will mostly consist of. This weeks vactivity was a trip to Cape Point. This is the southwestern most tip of Africa (not the southern most tip which is Cape Agulhas about 3 hours drive southeast along the coast). It was super windy but very pretty views. There are baboons that are native to this park which were really fun to see but also a reminder of how stupid people can be. Baboons are very wild and quite frankly dangerous animals and it is so frustrating to see people try to get as close as they can to them to take pictures or whatever else they are trying to do. There was one woman in our group that crouched down right next to one for a selfie and later her and another intern put down their bags to dance and had baboons attempt to steal them. It is this ignorance that leads to so much of the human-baboon conflict. I saw in the news this week that a man was arrested for taunting a bison at Yellowstone. It is the same ignorance and stupidity that I witnessed with these baboons. The baboons seemed to keep to themselves mostly and there was a good chance one would run right by you or you would have to walk right next to one, but it is the purposeful acts of trying to get so close to wild animals that cause so many problems and most of the time it is the animal that suffers greatest. Other than that it was a wonderful trip. I also saw a Rock hyrax that was about a foot away from me, Cape fur seals, wild eland, and ostriches. It was fun to get out and see some different wildlife and not just from camera traps. On next weekend’s Garden Route trip I should have the opportunity to see most if not all of the Big 5. On Saturday we went to a local food market at the waterfront. There was so much food! I have a bowl of pho, which really made me feel better and cleared out my sinuses. Later Saturday night a group of us went to the opening match of Cape Town City F.C. which plays at Cape Town Stadium. This was one of the stadiums built for the 2010 World Cup and it was a magnificent place to watch soccer. Unfortunately, there were only about 5,000 people in the stands, which if you look at my pictures on Instagram can see that it is a small fraction of the capacity. But fun none the less. Sunday was a day to rest, mostly. As you read I had a frustrating trip to the grocery store, but other than that it was peaceful. Another week in South Africa, another week closer to the end of my trip. This week should bring some fun and exciting endeavors and be sure to keep posted by following my South African adventure on Twitter and Instagram. As routine starts to set in, my time here seems to become more natural. At this point in my internship I have left what I would consider the touristy stage, when everything is so new and you are just trying to figure things out. Now I have started to get the hang of things. I have figured out the best times to catch the train as to avoid having to ride in a jammed pack car and still make it to work on time. My week night evenings are starting to become a bit structured as well, similar to a normal schedule back home. I have found a gym that I like, which is actually in the process of moving to a location only two blocks from my house. I go into work and begin working on things I have to do without needing to ask for work to do. I go shopping for my groceries on Sundays as is done back home. After three weeks here I would say that I have adjusted and am in the process of trying to enjoy everyday here as my time here is flying by. Work this week was another productive/enjoyable week. I spent more time photo tagging and have continued to race through them by the thousands. We did a little maintenance around our office building. The deck was stained and some planks were replaced due to being rotted out and broken. The people I work with and many other South Africans I have encountered are very ingenuitive. I have seem some very clever ways of solving problems when doing things like fixing the deck and building other things around the reserve. I try to sit back, observe, and lend a helping hand where I can. Petro, my supervisor, two people with the city of Cape Town monitoring an evaluation department, and myself conducted bird surveys on Thursday. We did this with sound recorders, going to twenty different locations, ten in each the control and experiment site, and recorded for eight minutes at each location. Someone will then go through all the files and identify the birds from their calls and songs. They chose this style because of how dense the brush is and it would be impossible to get any accurate data from attempting point counts or other visual methods. I had many exciting adventures over the weekend. For our Friday vactivity we went to the township of Khayelitsha were Mama Suli hosted the interns for a braai. We had some much good food, but even better than the food was interacting with the kids. They danced for and with us, we played soccer, used a soccer ball to play volleyball, and got to just talk with them. One conversation I had was with a twelve year-old boy named Matthew. We talked for quite a bit, mostly about soccer, and he could name every starting player for the french national team and many others. This event may end up being one of the best experiences I have while I am here. Check out Instagram to see photos of the braai. On Saturday a whole bunch of us went the the Old Biscuit Mill for shopping and food. Mostly the food for me. I started with “breakfast,” which was lamb curry. After a while I had a snack, which were some Greek bread filled with feta. I finished with a double scoop of delicious coffee and toffee ice cream in a waffle cone. But not to worry about all this eating because in the afternoon we went on a sunset hike up Lion’s Head. This was a pretty steep hike, using chains and ladders at some points, but ending with a spectacular view of the city and ocean. After this we grabbed dinner in out neighborhood and called it an early night. On Sunday, some of use went the the V&A Waterfront Mall to get a few things that we cannot find in our neighborhood and grabbed lunch in the food mall (yes, more delicious food). I got a Hungarian flatbread topped with mushrooms, lamb, arugula, and a sauce. While we ate we sat next to a pop-up dog adoption company. They are working very hard to save as many dogs as they can here in the Western Cape. Only 1 in 10 dogs that end up in a shelter will survive and be adopted. The WOOF Project brings the dogs to popular areas in town to help raise awareness of this issue. It will be very difficult not to adopt a pup while I am here. We finished out the week with another braai at my house, which I think is now a weekly event. We had good food, drinks, and played some games. Well it has been another successful week in South Africa. Lets see what the next one has in store. I have now spent a full work week at my internship site., which was a good week at work. The first half of the week I spent the afternoons in the veld with the eland and a monitor, getting to know the project and understanding the importance of the monitors works. In the mornings I was working on getting a program called Timelapse2 set up to use for photo tagging. The nature reserve has had camera traps set up for the last two years spread out through control and experimental areas. They have divided up data collection on the camera traps into sessions. The first two sessions of photos (which for anyone who has used camera traps knows this means thousands upon thousands of photos) were entered using an excel sheet and simply going through the photos on a photo viewer. Each photo had to have its image file name and corresponding data entered manually. This is effective but extremely time consuming. So this is one of my main projects. I am working on the third session of photos collected which is several months worth. My first task was reading a 100 page long manual on how to set up the photo tagging software, create a template for the data collection, and then play around with it to figure out if I set it up right. After I got Timelapse2 all set up I spent the second half of the week going through photos. Over the next couple of days I went through over 15,000 photos, which was only one months worth of photos. If I am correct this session has files from December 2017 to April 2018. So that means I still have 4 months worth of photos to tag. And if I am efficient at this session and time permits I will go through the previous two sessions’ photos so that all the data can be in the same format. Even though staring at a screen for 8 hours can take its toll on the eyes, it is fun to see all the wildlife that is out there. I have seen the eland and so many other species these last couple days. There are so many different types of birds, I have seen water and small grey mongoose, common genet, grysbok, hippo (the only reserve in the Cape Town region with hippo), my personal favorite the caracal, and my least favorite the boomslang. Boomslang are a venomous snake that tend to spend their time in trees and it’s not that I do not like them, I just prefer them on the computer screen and hope not to run into one out in the field. I also got to join in on a walkabout through the veld with city managers and other project members as they discussed what they were hoping to get out of the project and to talk about its future. This gave me a very interesting insight into how this project works and how it can stay viable for years to come. This was my work week, lots of new and exciting things. I also had a busy week for the touristy stuff. Monday nights are a culture series put on by VAC. This Monday was an introduction to South Africa. Then on Thursday I went out with a big group of the other interns to the local neighborhood bar. Friday was our weekly activity put on by VAC, our “vactivity”. We went on a short hike to Elephants Eye Cave. It gave breathtaking views of Muizenberg beach and the cape flats area. Check out Instagram for photos. Saturday I went to Old Biscuit Mill, which is a local neighborhood market with lots of trinket shops and tons of good food. In the afternoon I went to the V&A waterfront and walk around the boardwalk area. Then spent three hours walking around the biggest mall I think I have been in, all in an effort to buy a second towel and an external hard drive. And the pièce de résistance was Sunday’s trip to Muizenberg beach, where it was about 80 degrees and sunny, followed by a braai with some other VAC interns at my house. This was a fun and exciting week and I can’t wait to see what else South Africa has in store for me. It is now the weekend of my first week here in Cape Town. There have been quite a few ups and downs getting settled in my new city. Overall it has been an amazing week, however, it is definitely important to make sure everything is all lined up when you are living somewhere else for an extended period of time. Some of the things I wish would have gone smoother included: getting a South African phone, feeding myself, sleep, and Uber. On my first full day here I had orientation, when I should have got a phone set up. I was planning on using a burner phone. Well I did not end up getting my phone until the second day and ran out of time to set it up with my internship coordinators. Long story short, the burner phone was so slow and incapable of working to order Uber and use WhatsApp. The two things I bought it to use. So that means putting the SIM card into my US phone, not a biggie, a little frustrating but not the end of the world. Uber has been the bane of my existence this week. Because it did not work on my burner phone I was almost stuck at my work site on Thursday. I spent a good 20 minutes trying to get the phone and Uber to work to get home for the day. Neither was happening, so I had to call the internship office and someone there order me one. Since I switched to my US phone I thought it would work just great. Well this morning I woke up to go on a sunrise hike at 7:30 am. At 7:15 I try to order a Uber. The data is working just fine, everything is loading, then “verify card.” So I spend the next 3 hours trying to get a form of payment for Uber. Spent half of that trying to verify my bank with PayPal. Hopefully, it is now all squared away but I don’t want to get my hopes up. Feeding myself this week took a few days. The first day here I had every intention on going to get groceries, turned out I was super tired and fell asleep as soon as I laid my head down. The next day, Wednesday, was a bus tour. I did eat dinner this day. Finally, got to the grocery store Thursday after work. The last trial has been sleep. I think I am finally on a proper sleep schedule. Throughout the week, if I was not in an organized activity I was asleep. But the weekend should put me on track. So now that it seems like I had a terrible week, lets talk about all the fun and amazing things. On Wednesday I took a bus tour. It was one of those giant double decker tourist buses. Always thought they were kinda lame, but honestly a great way to see Cape Town for the first time. I went with 6 other interns. Our first stop was in Constantia where we visited a winery. Turns out at 11 am, going on your third day with minimal food, wine tasting gets to you quick. The wine was delicious though. Next we stopped off at World of Birds. Starting as a personal bird collection years and years ago, it is now a bird and monkey sanctuary. There were so many different birds and we got to go in an enclosure with some monkeys that just climb all over you. Our final stop was the waterfront. Here I had my first proper meal in Cape Town. Went to a restaurant that served just about everything. I had a pizza, which I made sure to have leftovers for work the next day. Thursday was my first day at work. I started the day by going to a post mortem (necropsy) of a porcupine. Then the afternoon was spent out with the eland and a monitor. They are magnificent animals. The monitors are with them whenever they are out of their boma (enclosure) to not only collect data but to protect them from poachers and other hazards. The monitor was telling me how violent some of the neighborhoods are (not mine) and how he hopes he can one day and afford to move his family. It is really a different world here and in just the few short day I have been exposed to so much. Everyday here make me appreciate so much more what we have in he states. We take so much for granted. Here in Cape Town it is inadvisable to walk down the street by yourself after dark. In my neighborhood to avoid getting mugged for your phone or wallet, but in the monitor’s neighborhood it is to avoid being killed. Gang violence is so bad that he said even the police are scared if they are not in a large enough group. It is so important to understand and have an awareness of what goes on in the world outside out little bubbles back home. Friday, VAC is took us to do a wine tasting like an hour to the north at a vineyard and farm. They do different activities every Friday. Next week is a hike and the week after is a braai (BBQ), weather permitting. We will see what the rest of the weekend has in store for me.